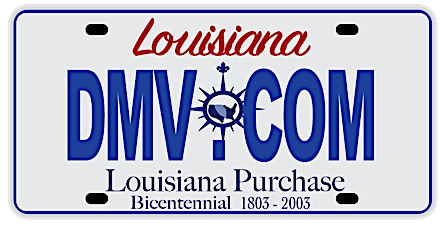 DMV.com was created to help simplify your life by providing you with all the vehicle related information and Louisiana DMV services you may need, in one place. Quickly find information and services regarding driving records, vehicle registration, drivers license renewal, license plate renewal, getting a learners permit, and finding a Louisiana Department of Motor Vehicles approved traffic school. Learn about drivers license services offered by the Louisiana OMV. An OMV drivers license is required for residents who want to drive. Order your Louisiana DMV driving record from the comfort of home. Requesting LA driving records online is the easiest way to obtain them. Auto insurance coverage is mandated by the OMV for cars registered in LA. Get low cost car insurance in LA at our online car insurance page. Enroll in LA online traffic school quickly and easily. Passing an online LA driver improvement program may allow you to avoid OMV demerit points. Completing a Louisiana DMV practice exam can help you earn a license. Take an LA DMV driving practice test to gauge your driving knowledge. The OMV requires car registration for LA motorists. Learn about OMV car registration, from getting car registration to registration renewal. Drivers education is required by the Louisiana DMV for first-time drivers. Learn about driver training in Louisiana for minors and adults. Learn how to get a DMV bill of sale at the LA DMV. A bill of sale is an important receipt that acts as a record when you buy or sell a car. Learn how to pay a ticket online or begin a traffic ticket defense in LA. Failure to respond to traffic tickets can lead to DMV penalties. Learn about DWI laws in Louisiana administered by the OMV. Some LA DUI consequences include license suspension and fines. Buying a car online can simplify your OMV registration process. Before you buy a car in Louisiana, consult our helpful online resources. Locate an LA DMV office in your area where you can obtain DMV services. DMV locations are available throughout the state of Louisiana. We are glad to welcome you to the most easy-to-understand guide to the Louisiana Office of Motor Vehicles. Here you’ll find only the most up-to-date info regarding the Louisiana DMV. DMV.com is a privately owned website that’s not affiliated with any government agency, so it has nothing to do with any government bureaucracy.Our articles break down for you all the specifics you need to know, from car driving and ownership, to the steps of how to get your LA driver’s license, vehicle registration or auto insurance. You will find your desired info in a second. Feel free to comment our articles, and make sure you check out our Facebook fun page as well. By doing so you will help us get even better.